Cowboy up with Ranch-Style Beans. 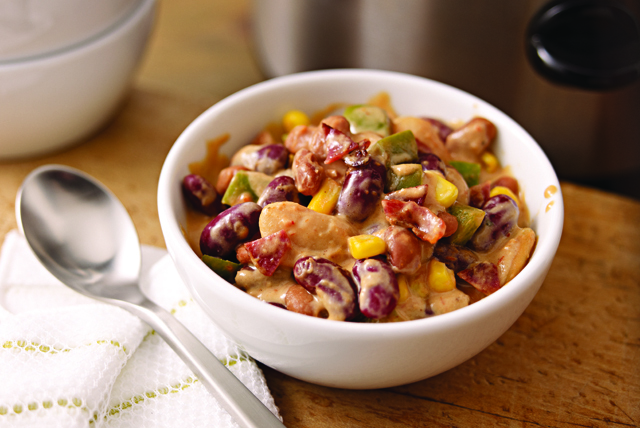 Kidney, butter and pinto beans simmer with onion and BBQ sauce to create this complex Ranch-Style Beans recipe. Mix cream cheese spread, taco seasoning mix and milk until blended. Combine all remaining ingredients except bacon in slow cooker. Stir in cream cheese mixture; cover with lid. Cook on LOW 4 to 6 hours (or on HIGH 3 hours). Top with chopped fresh cilantro and a squeeze of fresh lime juice just before serving.